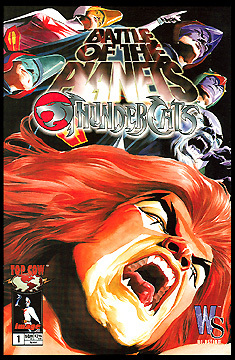 Information: The first Battle of the Planets and Thundercats crossover published by Top Cow, with standard Alex Ross cover. This standalone story was completely different than the Thundercats and Battle of the Planets story published by Top Cow, and it did not feature into either series' regular monthly storylines. Top Cow published an alternate cover for this story, here. Art by Alvin Lee and Rob Ross, story by Munier Sharrieff. Full Color.